Mayor Thomas M. Menino, seen here at City Hall Plaza on the Fourth of July, says the book will be as much about the city as about him. It’s expected to be released next spring. Mayor Thomas M. Menino of Boston has inked a deal to author a book chronicling his life, career, and long reign in City Hall’s corner office. “It’s a story of my 20 years as mayor, the things we’ve dealt with, and the changes we’ve seen,” Menino said during an interview in his City Hall office on Friday, which marked the 20th anniversary of his swearing in as acting mayor in 1993. The book will be co-written by Jack Beatty, an author and political analyst for public radio. Menino said that Beatty, who grew up in Codman Square, was an obvious choice to coauthor the project. He is the author of “The Rascal King,” published in 1992, which is considered the definitive account of former Boston mayor and Massachusetts governor James Michael Curley. 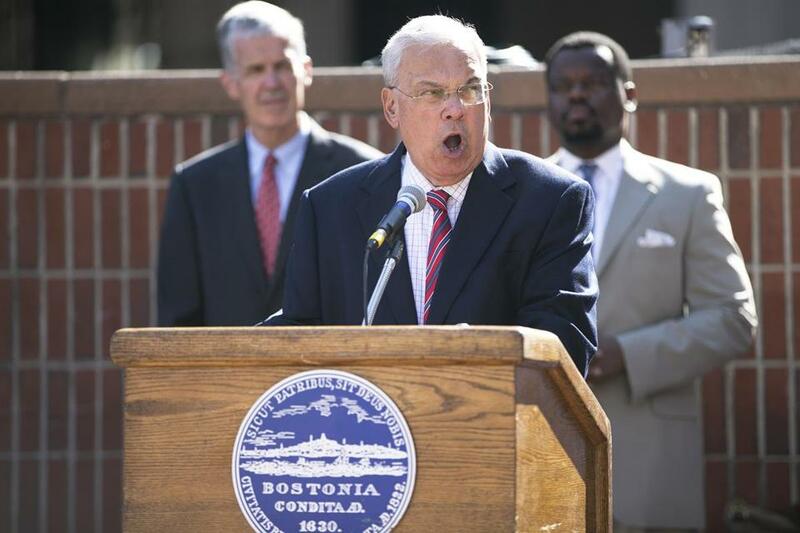 In previous media appearances, Beatty has noted that Menino was far from a politically grandiose mayor or orator. Now, as he delves into the record, accomplishments, and past statements of Boston’s longest serving mayor, the author said Menino’s legacy will be his ability to relate and remain accountable to the voters who faithfully returned him to office for term after term. Menino said he has long thought about writing about his time as mayor, but wanted to wait until the end of his time in office to avoid being accused of working on the book on city time. “Now that I’m in my waning days, it’s time to put some history down on paper,” he said. Rather than a traditional memoir, the mayor notes, this book will be as much about the city itself as it is about him. The book, which is expected to be released next spring, is being published by Houghton Mifflin Harcourt. Menino did not disclose how much he is being paid. Houghton’s regional ties could help the book make inroads, said Ike Williams, one of the founders of Kneerim, Williams & Bloom Literary Agency. But while Menino is a giant political figure in Boston, Williams said that a title bearing his name is not necessarily a guaranteed hit nationally. The book will note Menino’s humble upbringing in a Hyde Park home where his grandparents lived on the first floor. It was in that home that Menino’s parents instilled in him the values that support his unfailingly confident demeanor and leadership style, Beatty said. In researching the book, Beatty has begun a series of meetings with former Menino staffers, current aides, journalists who have covered his time in office, and family members. He is also slogging through tens of thousands of articles, academic journal entries, television appearances and other media pieces in which Menino has appeared over the years — including at least 35,000 mentions in the Globe during his time in office, Beatty said. Focal points will be the mayor’s attempts to overhaul the city’s education system, the transformation of its once-tense racial climate, and efforts to improve public safety, Beatty said. “He said in his second state of the city address ‘judge me by these schools.’ No mayor in America, I believe, to that point had ever said that,” Beatty said, adding that for most mayors, education is something left primarily to the school committee. The mayor said the book will certainly include stories about other politicians, specifically the late Senator Edward M. Kennedy (whom the mayor heralded as “the best elected official I ever worked with”) and Bill Clinton, the former president for whose wife the mayor ardently campaigned during her own White House run. But more important, Menino said, his left arm resting on a cane as he sat in a cushioned chair in his office, will be the stories of Bostonians who helped him change the city. Correction: Because of a reporting error, an earlier version of this story misstated the year that “The Rascal King,” by Jack Beatty, was published. It was published in 1992.